Skopje (also known as Skoplje, Shkupi, Uskub, Skopia) is the capital and the largest city of the Republic of Macedonia. Skopje is located in the north-western part of the republic and it's 169 km away from the second largest city in Macedonia, Bitola. 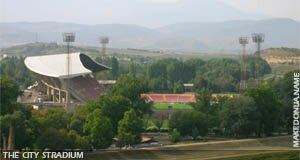 Skopje lies on the both banks on the upper course of the Vardar river and on the meridian passing through the Morava-Vardar valley. Near Skopje passes the main Balkan highway, the E-75. This highway connects Skopje with Belgrade (440 km away) and Solun (Thessaloniki) and the Aegean sea (250 km) in the eastern Mediterranean. Skopje is just 647 km away from Athens, 230km from Solun (Thessaloniki), from Sofia 170 km & from Bucharest 460 km away. Many other communications that lead to Skopje or pass through it branch off this road. Surmounting the gorge of Kacanik, one road leads to the Serbian province of Kosovo, and continues on to the blue and wonderful Adriatic Sea. This road begins in Skopje, passes by Pristina, Kosovska Mitrovica, leads through Rozaj, Podgorica to the Montenegrin coast and brings Skopje closer, just 400 km to the Adriatic coast. Skopje's location is not important only now, it also has a great future importance. Skopje has always been an administrative, cultural, political and traffic centre. The strategic importance of Skopje's geographic position was noted long ago in the maps of all the conquerors whose appetites spread to this valley, both in direction of the Aegean and the near East, and also in the opposite direction, to the north. Skopje is situated on an altitude of 255 meters above the sea level and lies in the Skopje valley. The eastern exit from the valley connects it with Ovce Pole (besides Pelagonija, the second granary of Macedonia) and the Kumanovo-Presevo valley. Several mountains rise above Skopje on the other side, sheltering it under their peaceful leeward slopes. To the south the natural border if the Skopje vicinity is the Vodno mountain with the peak Krstovar (1,066m), which extends on to the Jakupica-Karadzica mountain range, whose highest top is Solunska Glava (2,540m), with a view of Solun (Thessaloniki) and the Aegean Sea. To the south-west, the Skopje valley stretches to mountains Osoj (1,506m) and Žeden (1,260m), in the directions of the white tops of the Sar Mountain. On the north, the Skopska Crna Gora mountain rises above the Skopje valley with it's highest peak Ramno (1,561m), whose easily accessible slopes are dotted with inns for excursionists. The Vardar river enters the Skopje region at the Derven canyon, north-western and leaves at the Taor canyon south-eastern of Skopje. "... In just a moment 24 towns were destroyed. Scupi, the capital of Dardania, was leveled completely as if it had been sacked by the most terrible conquerors. A crack of 30 miles long and 12 feet wide appeared, gushing hot stream." Wonderful architectonic buildings, numerous public baths, temples and the ancient amphitheater built in a roman style, large basilica with mosaic floors have completely disappeared from the earth’s face. Since then Scupi is not mentioned any more. Archeological excavations show life continued in the north-eastern part of this Roman city, later in the 6th century. During the Byzantine Emperor Justinijan 1st, the Skopje valley got a new city center called Justinijana Prima, after it's founder the Emperor Justinijan, whose family was from the Taor village (in the vicinity of Skopje). During Justinijan 1st, Slavs started to invade these areas. As defense Črni Castle was built on the foothills of Vodno mountain. By the end of the 6th century, in front of the ramparts of Skopje the Slavic people have showed up and the Slavic tribe Beregeziti (also known as Berziti), managed to conquer Skopje in 695 AD and later gave the new name - Skopje. The native inhabitants were mostly slaughtered or driven away and some were gradually assimilated. This same tribe was later recognized as the rulers of the territory between Skopje and Ohrid. The next three centuries there are no written documents about Skopje. The end of the first millennium brought the first Macedonian state and the Macedonian Emperor Samoil (976-1014). In this period 10th-11th century, Skopje continued to develop. Merchants from Samoil's empire spread their trade to neighboring cities, both to the north and to the south, along the Adriatic coast and Dalmatia. Skopje retained its prestige although it was neither capital nor administrative centre. During the reign of Samoil, Skopje was commanded by a Roman who returned from Constantinople. 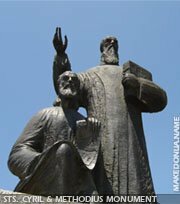 Later on in 1004, during a battle between Samoil's soldiers and the Byzantine, he betrayed Skopje to the Byzantine Emperor Vasilius 2nd. The tragic end of the Emperor Samoil at the Belasica battle in 1014 brought hardship back to Skopje. "Under the town ramparts there is also a suburb with the most beautiful cathedral I have ever seen in these regions." "In the year of 69... when the Turks arrived in Skopje in the month of gonever..." (according to the new calendar this was January 19th, 1392)." 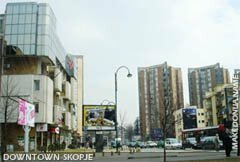 "Skopje has 70 town quarters with 11,060 houses one or two storeys high. The houses are made of stone or of mud, but all covered with red tiles. The streets are clean and straight, paved, and the business district is full of Latins, Frenchmen, Hungarians and others. Around Skopje there are 77,000 dulums of private land as many vineyards owned by religious establishments." "I traveled for a long time across that country of Rumelija and I saw a lot of beautiful cities and I was amazed from the Allah's blessings, but not one has impressed and delighted meas that city of paradise - Skopje, through which the river Vardar flows." Some historians say that in the period between 15th and 17thcenturies Skopje was one of the richest towns in the Balkans. 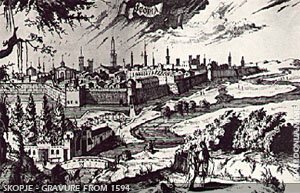 All this was made possible in the first place because of its location, and the fact that the frontiers of the Ottoman Empire were very distant. Deep inside the Empire, Skopje was allowed to develop into an economic and crafts centre. According to some sources, in the wealth and size Skopje was the second town in the whole European part of Turkey. Most of its inhabitants were Macedonians, and so were the villagers on the hills of Skopska Crna Gora, where the Slavic way of life and ethnic characteristics could survive more easily. Bishop Marin Dichi from Bar wrote in 1604 that Skopje had about 200,000 inhabitants in over 40,000 houses. These numbers are certainly exaggerated, but nevertheless many travelers passing through the Balkans and Macedonian described Skopje as a "large town". "Skopje is spread over a large area and is only a little smaller than Prague. The town is surrounded by beautiful orchards in a large and rather fertile and well cultivated plain. It has almost 60,000 inhabitants, among them 2,000 Jews." "I decided, although it was not easily, to burn the town into ashes. I am sorry for the houses such as I have not seen at all in this war. The mosques are from the highest quality marble and porphyry, decorated with thousands lamps on a golden plated holders, which one would devote equal attention even in Rome. I feel sorry for the nice antiquities, gardens andpleasure grounds. All this I give to the flames so as not to leave the enemy anything he could put to use." The fire was raging for two days and except the massive stone buildings, Skopje was completely destroyed. It was "ill" for a long time afterwards. Up until the half of the 19th century, Skopje could not recover back its previous appearance in front of which the numerous people who write about their traveling have stopped with a delight. Amy Bue, a French geologist traveling through Macedonia, noted that Skopje has 10,000 inhabitants. In 1836-1837, the first public Slavic school was opened in Skopje. In the same year, according to Amy Bue, Skopje had three schools in which geography, history and philosophy we taught. It is interesting that the Macedonian crafts guilds gave great financial aid to these schools. In thesecond half of the 19th century, Skopje becomes an important traffic center. It's population doubled. More than 60 different crafts were developed. Moving towards the countries from the middle east, Napoleon has found out the road through Skopje. A lot of merchants with their endless caravans loaded with various goods have been passing through Skopje. In this period Skopje reaches the biggest development of the handicrafts. Later, Skopje begins to change its appearance. In 1872 the Skopje Archbishopric was finally separated from the Patriarchy of Istanbul. But instead of gaining independence, it was joined to the Great-Bulgarian Exarchy, which meant new danger from the penetration of another foreign propaganda in Macedonia (Greek already existed). A new chapter in the history of Skopje was the construction of the Solun (Thessaloniki)-Skopje railway in 1873. Skopje then became a modern railway town, confirming its importance as a traffic centre. Due to the Internal Macedonian Revolutionary Organization activity in the Skopje region, only 528 persons were arrested in Skopje, after the great Vinica scandal.Skopje was an Ottoman city for 5 centuries, from 1392 to 1912. The two Balkan Wars (1912-1913) changed the situation in the Balkans, but nevertheless they did not bring freedom to Skopje, Macedonia or the Macedonians. Macedonia the largest Ottoman province, was divided between Greece, Bulgaria and Serbia, while small part were given to Albania. On October 12th 1912 the Turks were driven away from Skopje, but the Serbian army remained. Together with Skopje, the whole Vardar Macedonia remained under Serbian dominance. The Treaty of Bucharest from 1913 decided the fate of the Macedonians, dividing Macedonia, between Greece, Serbia, Bulgaria and Albania. The international Nobel prize winner, Mother Teresa (Agnes Gonxha Bojaxhiu) was born in Skopje, on August 27th, 1910. During the First World War (1914-1918), Skopje was occupied by the Bulgarian, German and Austrian armies. Terror and crimes increased in violence. After the 1919 Versailles Peace Treaty, according to which the Vardar part of Macedonia - the territory of present-day Republic of Macedonia - became part of the newly-created Kingdom of Serbs, Croats and Slovenes, later known as the Kingdom of Yugoslavia, which existed until 1941. Between the two world wars, Skopje has expanded on the other bank of the river Vardar. Skopje expanded on the right bank of the river Vardar. The area from the Stone Bridge to the Railway Station became urban. Hotels, restaurants, bars were built. 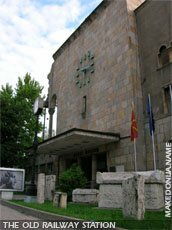 Skopje got a significant buildings: Assembly, Army House, National Bank, new Railway Station (1938) as well as many other. Skopje became a seat of a larger district in southern Yugoslavia, Vardarska Banovina, which included all Vardar Macedonia, parts of Kosovo & Metohija and southeastern Serbia. Being a seat, during the Second World War (1941-1945), Skopje became one of the first victim-cities, it was bombed by Fascist planes on April 6th, 1941, which resulted with 600 dead and 1,000 wounded. The next day, April 7th, units of the German occupation armies entered Skopje, followed by Bulgarian occupiers with their engines of denationalization. On October 11th, the very same year, 1941, the strong desire for freedom of the Macedonian people flared out more strongly than ever before. The rebellion had started in Prilep and Kumanovo. In a decisive struggle against all the enemies, diversions were organized in Skopje. The First Skopje Partisan Detachment was formed immediately after the occupation, while during the war two Brigades. 5,000 inhabitants of Skopje lost their lives in the war, some as fighters and some as victims of Fascist terror. About 7,200 Jews were deported from Skopje and Macedonia on March 11th, 1943. They vanished forever in Treblinka and many other Fascist death camps. In the last autumn of the war Skopje dawned in freedom. The day to remember was November 13th, 1944. Immediately after the liberation, the Second Session of the Antifascist Assembly of National Liberation of Macedonia (ASNOM) was held in the liberated city. This session in Skopje, laid down the broad principles if the Macedonian Republic within the Yugoslav federal system. Numerous cultural monuments were seriously damaged or erased from the face of the earth. Skopje was rebuilt since then and the new residential quarters bear little resemblance with old Skopje. Many international architects participated in is reconstruction. 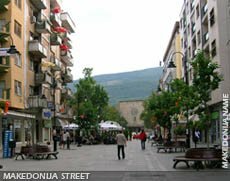 According to the idea of the Japanese urban planner Kenzo Tanga, the center was given a "City Wall known on Macedonian known as Gradski Zid" of high - rise buildings up to 6 and 12 floors, while the banks of the Vardar were laid out as pleasant tree - lined promenades. The ancient trading quarter (carsija) has been completely renovated, but has preserved all the notable features of its original architecture. In this setting the old buildings of cultural and historical interest are seen to even better advantage. They include the Kale fortress, the clock tower, Hjuncar mosque, Mustafa Pasha's mosque, Holy Saviour (Sveti Spas) church, and Daut Pasha's baths. While, the Army House, the church St. Constantine & Elena, the railway station were not renovated. The remains of the Jewish neighborhood in the downtown vanished forever. After the earthquake new and modern boulevards were built in order to connect the new settlements that were built, by donations of the International community. New settlement were raised up: Butel 1, Butel 2, Metodija Andonov-Čento, Avtokomanda, Lisice, Aerodrom, Dracevo, Vlae 1, Vlae 2, Taftalizde 1, Taftalidze 2, Vodno, Kozle, Crnice, Przino, Železara, Karpos 3 and Karpos 4. Skopje, due to the 1963 earthquake is known as a city of the International & World Wide solidarity. The largest orthodox church, St. Clement was finished in 1990. Skopje today has 467,000 citizens, of which 65% are Macedonians, while the other 35% counts the ethnic Albanians, Turks, Serbs, Bosnians (Bosnjaks), Roma and others. The Roma people in Skopje have the largest neighborhood in Europe (16,000). Bitpazar in downtown Skopje, is where Albanians live as a majority of the population and represents a red light district in Skopje (crime is very high in this area). Industries in Skopje include iron and steel works, electrical machinery, chemicals, textiles, carpets, and foodstuffs. Skopje is a trading center for the cotton, tobacco, grains, and livestock produced in the surrounding region as well. Besides the Belgrade - Athens highway and railway routes, Skopje also has the largest airport in the Republic of Macedonia. The Petrovec - Alexander The Great airport is just 17 km away from Skopje. You can reach Skopje by train, car or plane. The first train that arrived in Skopje was the one, from Solun (Thessaloniki) in the distant year of 1873. Also this railway line, Salonica - Gevgelija - Veles - Skopje represents a part of the corridor Belgrade - Athens, is actually first railway in Macedonia. Skopje plays a vital part in the cultural and the academic life of the Republic of Macedonia. It is the home some educational institutes: Macedonian Academy of Science and Arts, the Saints Cyril and Methodius University, the National and University Library, FON College; home of some cultural institutes: the Macedonian National Theatre and it's Drama, Opera and Ballet companies, the Drama Theatre, the Theatre of Nationalities (Albanian & Turkish Drama), the Philharmonic of Macedonia, Macedonian Radio and Television and Nova Makedonija, the largest newspaper and publishing house, the Universal Hall (Univerzalna Sala). 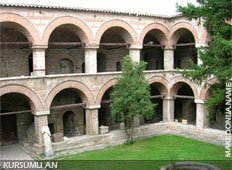 There are also the Archives of Macedonia, the Museums of Macedonia (archeological, ethnological and historical), the Natural history Museum, the Museum of Contemporary Art, several art galleries and other important cultural and scientific institutions. Also many cultural events occur in connection with Skopje: the "Skopje Jazz Festival", "Zlatna Bubamara", "12 Velicevstveni", The "TAKSIRAT", "Skopje Gori" and many others. The Governmental building and it's ministries, the Assembly of the Republic of Macedonia are settled in Skopje. Since the year of 2000 the citizens of Skopje, from every part of Skopje can see the Millennium Cross, that symbolizes 2000 years of Christianity. It was built on top of the Vodno mountain, located south of Skopje, at an attitude of 1,066 meters above the sea level, with it's dimensions 66 and 20 meters. It is unique building in the world. There should be built a monastery complex in it's surroundings and a restaurant with a spectacular view of Skopje. Old Skopje Bazaar: On the left side of the river Vardar, in the ancient part of Skopje is the old Skopje bazaar. Up to the present time the bazaar has experienced several changes in respect of the appearance and the organization, but it has still kept the spirit of the past. In the small innumerable handicraft shops, the Skopje's handicraftsmen can still be seen, tailors, cobbler, quilt makers, shoe makers, tinsmiths etc. The old market place is still alive and full with a vivid atmosphere which radiates from the small shops, coffee and tea rooms which are always full with tourists which are delighted from the appearance and the life of this part of Skopje. Today most of these crafts are produced in factories, so only a few of the craftsmen remained keeping their jobs. Most of the shops here are for clothing, shoes, jewelries, restaurants, cafe-bars and tea-bars. The Old Skopje Bazaar as a larger district include several cultural-historical monuments. Most of them are restored like: St. Spas church, Mustapha Pasha mosque, Čifte Amam, Daut Pasha Amam (amam-bath), Kapan An, Suli An, Kursumli An (An-Inn). This district is one of the oldest in Skopje. Every corner here, tells his own history. Clock Tower (Saat Kula): This monument is located on the "Krste Petkov-Misirkov" street, on a hill behind the "Sts. Cyril & Methodius University". 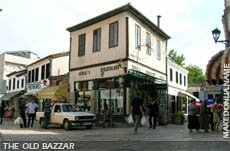 It is a Turkish object, built east of the famous and oldest market place of Skopje, Bitpazar. It stands in the forecourt of Hjuncar - the mosque of Sultan Murat 2nd. It has a hexagonal foundation and has a different rooftop which resembles the numerous lateral domes of the new Moscow style of the Russian medieval architecture. This element had been previously employed by Mongolians. The Clock Tower was built between 1566 AD and 1572 AD, most probably on the foundations of an already existing building. Initially, the upper part of the Tower was made of wood and the clock mechanism was brought from Skopje of Siged in Hungary. Writers that visited Skopje in the 16th and 17th centuries, noted that the Turks even brought a clock-master from Siged for the clock's maintenance. This was of great importance for the accurate performance of the five daily prayers. Many travelers mention the clock tower in their journals, as a large and important building in Skopje and add that its sound can be heard several kilometers away. After the great fire in 1689, when the tower was seriously damaged it had to be repaired. Some alternations were made in 1902/3, a new top (made of Thessaloniki bricks) replaced the original wooden top of the clock, during the reign of Ali-Hivza Pasha. In addition, the clock mechanism was replaced with a new one, this time brought from Switzerland. During the 1963 earthquake, the clock tower was seriously damaged in addition to the Hjunkar mosque. The clock mechanism, was stolen during the 1963 earthquake and was replaced by no one, so far. 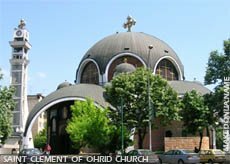 Sveta Bogorodica (Holy Mother of God): This church was built in 1835 and was main cathedral church in Skopje. It was also known as the protector of Skopje. The iconostasis was finished in 1842. On April 7th1944 the cathedral church, was burned down by the Bulgarian fascists. The entire iconostasis was burned, while important subjects were stolen and taken to Bulgaria. It's located on the Krste Misirkov bvd, opposite the Macedonian Academy of Science and Art (MANU). Today its in reconstruction. Feudal Tower: Makes part of the House of ARM, the unique preserved monument in the new part of Skopje, by the monument of "Mother Teresa". The time when it was built and the one who built it are not known. Most probably it is a feudal tower of some Turkish bay. Today it is in good conditions. Daut Pasha's Bath: This project is one of the most prominent monuments of the Islamic profane architecture. The Turkish bath was built by the grand vizier of Rumelija, Daut Pasha in the 15th century. In the first time it was used for the needs of its harem, and later it served as a public bath. Today, the Turkish bath is turned into an art gallery with a wide choice of Macedonian icons of the 14th to the 19th century, collective works of Macedonian artists - pictures, sculptures, graphics, and drawings and more recently in the rooms of the Turkish bath also concerts are held, promotions of books, theater performances with chamber orchestra etc. Holy Savior Church: (also known as Sveti Spas) It was built in the beginning of the 17th or 18th century, upon foundations on an older church. Part of the fresco painting on the southern side was found from this older church which origins from 16th century. In contrast to the modest outside appearance of the church, after one enters inside, he immediately becomes astonished in front of the beauty of the iconostasis on the eastern side. The 19th century iconostasis of the church of the Holy Savior, carved in walnut, combines a profusion of plant and animal motifs with the figures of saints in local costumes. 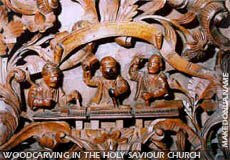 This realistic high-relief carving is the work of skilful craftsmen of the Debar area, who included their own figures in one corner of the iconostasis. The iconostasis is 6 meters high and 10 meters long. On this space, the carving group managed to show numerous scenes from the bible, important geometrical ornaments and figures from the flora and the fauna. The iconostasis at this church is one of the finest samples of traditional woodcarving which can be found on the territory of the Republic of Macedonia along with the iconostasis of St. Jovan Bigorski Monastery. 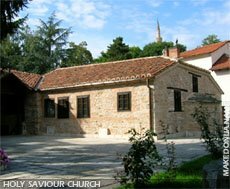 Goce Delcev, the well known Macedonian revolutionary organizer is buried in the yard of this church. St. Pantelejmon Monastery: This famous church, is located in the vicinity of the Gorno Nerezi village, on the Vodno Mountain, where Skopje can be seen on a hand. This church dates back from the 12th century, from the year of 1164 (the Byzantine period). The church interior is decorated with frescoes of exceptional artistic value. The Aqueduct: On 2 kilometers north-west from Skopje, the aqueduct was built of stone and bricks with 55 arches supported on massive pillars. For the building of the aqueduct there were shared opinions in the science. According some scientists it was a Roman aqueduct whereas according to others it was a Byzantium building. 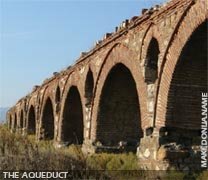 The last scientific researches connect the building of the aqueduct with Isa bey, which means that it was built during the time of the Turkish rule and more precisely in 16th century. Aqueducts in former Yugoslavia were only 3, one in Macedonia and two in Montenegro. 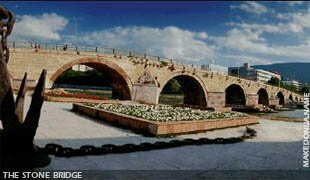 The Stone Bridge: According to certain data the bridge was built in the 6th century, whereas in its present form it was raised upon the old foundation in the time of the Sultan Murat 2nd in the first half of the 15th century. It was built of well worked out stone blocks and has 12 semicircular arches. This monumental building has undergone larger repairs through the centuries, but today the bridge has still kept the primary shape and form. The Kale Fortress: This fortress has the dominant place in Skopje. 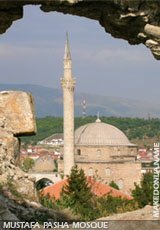 It was built of stone blocks from the ruins of Skopje of Scupi, during the rule of the Byzantium Emperor Justinijan the 1st. The ramparts of the Skopsko Kale are 121 meter long and today one square, one rectangular and one round tower are saved. It originates from the 6th century, while it's presents appearance is from the Ottoman period. The great complex since 1392 was stationary of the Turkish army until 1913, when Skopje falls under Serbian authority. And in the period from 1913 to 1953 here was settled the Yugoslav army. Today in the space of the fortress is an arranged park, which serves for recreation and fun, and in the evening hours besides the sounds of the Macedonian folks music, the visitors have a wonderful view on Skopje and the river Vardar from there. Mustafa Pasha's Mosque: In the vicinity of Kursumli-an, in the old part of Skopje this monument of the Islamic culture attracts the attention with its size and beauty. The mosque was built by Mustafa Pasha in 1519, the vizier of the Sultan Selim 1st. Particularly attractive part of this building is the tall minaret, made of cut stone, whereas the expanded part is decorated with ornaments.